It’s Veterans Day at the Iowa State Capitol. “Veterans Day” events are underway today at the state Capitol. 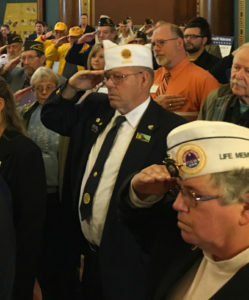 Organizers say much progress has been made to provide relief to veterans, but the groups involved are pressing for legislative action on a few key issues, like doubling the property tax credit for veterans. “I urge our veterans with us today to locate your elected officials and discuss our legislative initiatives with them,” Bob Steben, interim director of the Iowa Department of Veterans Affairs, said. Steben was among more than a dozen speakers at an hour-long event in the statehouse rotunda. Brigadier General Drew DeHaes of the Iowa Air National Guard leads units based in Des Moines, Sioux City and Fort Dodge. “Working together, we can tackle any issue,” DeHaes told the crowd. The veterans groups are asking legislators to waive registration and license fees for the vehicles disabled veterans drive. State officials say there are 37,000 disabled veterans living in Iowa today. “What our veterans have done for this state and this nation will never be forgotten,” Reynolds said. Governor Terry Branstad took a sick day Tuesday, but he was at the event today to welcome veterans to the capitol. “We need to make sure that we do all we can at the state level to honor and recognize the men and women who accepted the call of duty to serve the country and now need our assistance and support,” Branstad said. Branstad, a veteran who served stateside during the Vietnam era, did not address the specific agenda items veterans groups are asking lawmakers to enact this year. Representative Steven Holt, a Republican from Denison, is chairman of the House Veterans Affairs Committee. “Having spent 20 years in the United States Marine Corps, I understand that each of us stands here today as free men and women because of the sacrifices of our veterans,” Holt said. Holt promised to be “tenacious” in addressing veterans issues in the legislature. Kearns, a Democrat from Keokuk who served in the Air Force in the 1960s, is a member of the House Veterans Affairs Committee.